Starting the burn of the north-facing woods. The first line of fire was started at the bottom of the ridge. 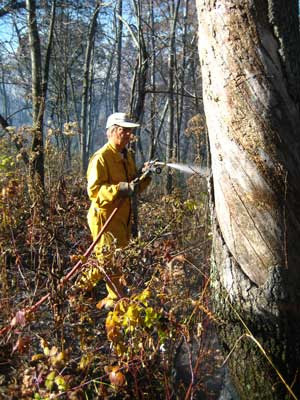 Getting controlled burns done in the fall is tricky, as the weather has to really cooperate. This week the weather was ideal and we spent the day doing some fairly tricky burns. We had six people from a contractor and five from Pleasant Valley Conservancy. Leading up to today, we had four days of great weather, including some strong winds to dry things off, lots of sunshine, and low humidity. Today the temperature got into the upper 60s, the humidity was around 35%, and the dewpoint around 25 F.
Although we burned two planted prairies, our main goal was to burn the north-facing woods, which is fairly hard to burn. You need several freezes to kill back all the vegetation and bring down lots of oak leaves. Then you need the Indian summer weather we had today. These are the conditions that the Native Americans waited for when they burned their woods and savannas (which is why this warm October weather is called "Indian" summer). The principal (really, only) fuel in a woods burn are oak leaves. They are quite flammable, burn hot, and are curled when they fall, so that the fire can jump from one leaf to another. Oak leaves "carry a fire", as they say. Leaves of other tree species do not burn very well at all. One reason the woods burns better in the fall is that the leaves are newly fallen, and have not been compressed by snow. Also, snow remains long in the spring on the north-facing slope, meaning that the oak leaf fuel remains wet and will not burn. Conditions in the fall are quite different. With the weather favorable, we jumped at the chance to burn. Because our woods are on a steep hill, we used four drip torches (and very little water). The technique used is called a "strip head fire". After putting in a blackline at the top of the ridge, next to our mowed fire break, the other three drip torches moved in parallel to the contours, the one at the bottom first, then the second, and then the third. 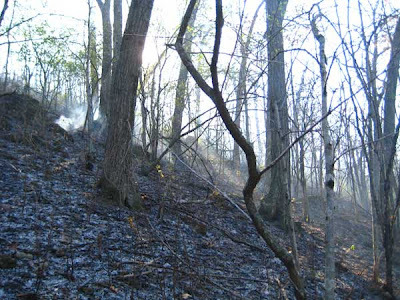 The steep hill encourages the fire to move up, and the wind was strong enough to push the fire in front of it. By using three drip torches, we don't need a continuous fuel load across the whole unit, like you get in a prairie burn. This is important because downed logs and timber often block the movement of fire in a woods burn. Since each fire line can burn both up and down, coverage is potentially lots better. The burn of the whole 25 acres was accomplished in less than an hour, after which we spent two hours mopping up. (We also spent two hours before the burn getting the fire breaks in final form.) Fortunately, mop up was not too much trouble, since the woods had been burned a couple of years ago (in the spring) and a lot of the punky downed timber that had been present was burned up then. The photo to the left shows mop up of a burning dead tree. Below is an interior view of the woods, showing the completeness of the burn. All the oak leaves are gone. What we are calling the East Basin (Unit 22 on the management map) is still much of a work in progress. This 4 acre basin at the far east of the Conservancy had originally been a prairie remnant but ended up as an orphan of the Lockwood Farm. Over 70 years it gradually filled in with junk shrubs and trees. Last winter a contractor spent several weeks cutting trees and shrubs, but due to the heavy snows most of the cut trees had to be left on the ground. 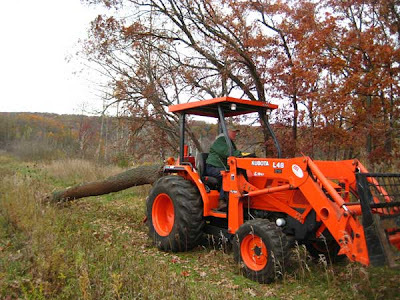 Our firewood consultant had managed to remove most of the black oaks, but the rest of the trees were still in place. Today we started to clear out the remaining trees. Two contractors were involved, one with a skidder on a tractor, plus four people with chain saws who worked along side. Because the skidder had a long cable, it was possible to reach most of the way down to the bottom of the basin. The photo above shows a long log on the way to its final resting place. Quite a few of the logs were black cherry, and were large enough to convert into lumber. Those are now on their way to a near by sawmill. The less interesting wood (mainly elm) will be turned into fire wood by a neighbor. We try to work cooperative arrangements with as many people as we can to remove the wood at minimal cost. It is still an expensive proposition. We had originally planned to plant this unit late this fall, but after a year lying fallow, there is so much "bad" stuff present that we have decided to delay planting for a year. Next spring/summer we will use heavy herbicide treatments to get rid of all the undesirable vegetation, and then plant next November. Some folks might remember that there were also about 100 large aspen trees in this unit, which have been girdled and are in the process of dying. However, it usually takes two years for the aspen to die, so we need to wait until next fall to cut and burn them. Another reason why we aren't planting this fall. I hope folks don't get too bored with my rants about buckthorn. It really is an awful plant, and much of the literature on its control is either wrong or vaguely described. There is a short period of time in the fall when buckthorn plants still retain their leaves and most of the native vegetation has senesced. This is one time to use a foliar spray. Since glyphosate did not work well last year, we have switched to Garlon (either Garlon 3A at 5% or Garlon 4 aqueous at 4%). 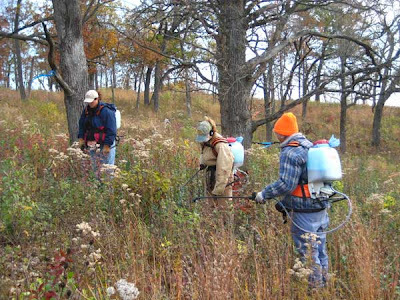 The photo shows our crew seeking out and spraying buckthorn in Unit 10, one of our nicer bur oak savannas. I estimated that in this unit about 60-70% of the surface had buckthorn plants, sometimes single or small clumps, occasionally large clumps. Our systematic approach to spraying is to mark about 10 foot wide swaths with colored tape, using a compass to run North/South lines. We start at one end of the unit, move through in one direction spraying every buckthorn plant we can find, and then turn and move back in the opposite direction in the adjacent swath. The photo shows three people working side by side. In some cases I worked along side so we had four people (although three is probably optimal). In several cases there were what can only be called clones. The literature does not mention that buckthorn shows clonal growth via rhizomes, but this is my conclusion after carefully digging up a number of plants. The presence of rhizomes is unmistakable. 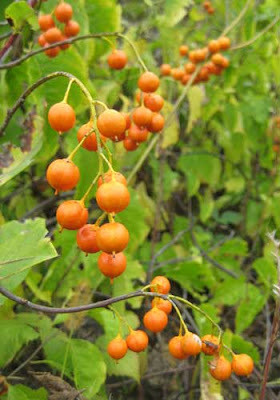 An example of what I am calling a buckthorn clone is shown in the photo below. It takes a lot of herbicide to deal with this mess! Fortunately, Garlon does not affect grasses, and we will be seeding such areas next spring. I estimated the person/hours to spray this unit, and then converted the number into hours per acre. It took us 27 person hours to spray this 2.5 acre unit, which is about 11 hours per acre. Plug in your hourly cost to figure out how much this would cost you. Remember that we are not dealing here with the original buckthorn shrubs. Those had been successfully removed in 2000-2001. Here we are dealing with the results of the seed bank, and in a site that has had successful annual burns for the past 6 years! As the days grow short, we are arriving at Pleasant Valley Conservancy when it is barely light. 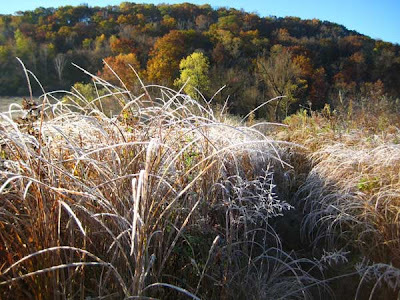 Tuesday was a crisp, cool day, and the frost was still on the prairie. 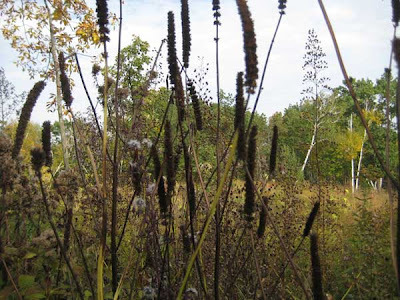 Kathie took the photo shown here of prairie grasses in the Barn Prairie. Since we were cleaning seeds in the barn, it seems an appropriate photo. The woods in the background is not ours but that of an absentee landowner. That hillside was logged off about 5 years ago, but it was a selective cutting, and only the large oaks were taken. What remains still looks pretty nice, thankfully. All this past week I continued to spray small buckthorn shoots with Garlon 3A. I was somewhat stunned by how many there were. The site I was working on (Unit 10) was cleared in 2000-2001 and has been burned annually ever since. Over the past three years prairie grasses have become established in the more open areas, and there are lots of good forbs, such as showy goldenrod, cream gentian, culver's root, stiff goldenrod, zig zag goldenrod, elm-leaf goldenrod, etc. But buckthorn persists. Some of the plants I sprayed were about shin- to knee-high, with multiple stems, but there were quite a few that were almost rosettes, barely ankle height, like those in the photo above. These look like seedlings to me, but I find it hard to believe that there is still a seed bank in this unit. There hasn't been a berry formed here for 7 or 8 years. There is so little data about basic ecology of buckthorn. There was some Canadian research on the extent of the seed bank, but no long-term research on how long the seed bank lasts. I am waiting for some faculty member at UW-Madison to take up the challenge and initiate a long-term program on buckthorn. The Arboretum has large populations of buckthorn, including some that are still making berries. I could think of some great research projects here! Also, I keep reading various web sites and weed manuals giving me misinformation about control. For instance, "buckthorn can be controlled by burning." Obviously wrong, if my observations in Unit 10 have any meaning. In the meantime, I am carefully marking all the areas I am treating so I can return to them next year and see what has happened. The photo below gives a little idea of what we may be up against. 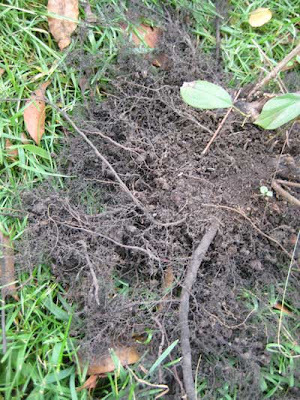 This was a buckthorn plant I pulled up by the roots from wet soil after a rain. The dark stem in the lower part of the photo looks like a rhizome to me. In fact, if I can get the right kind of soil conditions, I can pull up structures like this that are 3-4 feet long, and have other plants at their far end. The fibrous root network makes me wonder how much herbicide we have to get down there to kill this guy off. Follow this link to see what the site I have been working on looks like right now. I think you would agree it looks great. But get down on the ground and look at all those buckthorn plants!! Today, Kathie mowed the fire breaks at Black Earth Rettenmund Prairie, a State Natural Area that we manage. Although we won't be burning until spring (usually late March/early April), it is a good idea to set up the fire breaks in the fall. 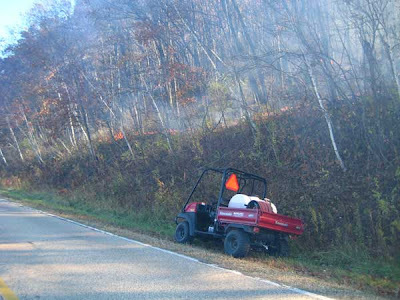 Fall is a good time to do fire breaks because the weather is usually favorable, and by mid October most of the vegetation is senescing, so that the mower can handle it fine. Waiting until spring is not a good idea, because one never knows when conditions are going to be favorable for a burn. With a short-grass prairie such as Black Earth Rettenmund, all it takes is two warm sunny days to bring the fuel moisture low enough for a good burn. Rushing over to mow then, when we are spending lots of time getting all the burn equipment set up, is not advisable. Because of the burns we are planning, we needed two fire breaks. Also, we needed to give the access lane a final mowing. It took Kathie about 3 hours to get everything finished. Our annual volunteer seed collecting workday at Pleasant Valley Conservancy and Black Earth Rettenmund Prairie went off very well. The weather was pleasantly warm (high 81 F); quite a change from last year when we had to reschedule because of rain. At Pleasant Valley, seed collecting concentrated on Indian grass, since we need a lot for the new planting we will be doing in the East Basin. In order to maintain our local genotype, we collect our own seed. The initial stock came from a tiny prairie remnant (Unit 4) where the Indian grass flourished after an initial burn in April 1998. The seeds collected that year were used to plant Toby's Prairie, and it was there that we collected today. Also collected were round-headed bush clover and stiff goldenrod. About 15 people participated at Pleasant Valley Conservancy and then were treated to an informal lunch. 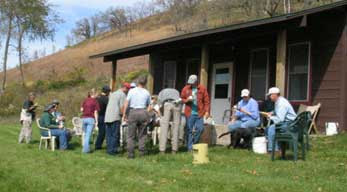 Many of the same people went to Black Earth Rettenmund Prairie after lunch, where they were joined by other volunteers. Several of the volunteers here were students or faculty from Edgewood College, a local college that likes to see their biology students get out in the field and volunteer. We collected over a dozen species at Black Earth Rettenmund, including rough blazing star, rose hips, thimbleweed, little bluestem, Solomon's seal and false Solomon's seal, Culver's root, and dwark blazing star. The asters weren't ready to collect yet; we'll have an ad hoc seed collecting activity later this month. The photo shows some of the Black Earth Rettenmund volunteers getting their instructions from Kathie Brock. Today was peak fall color at Pleasant Valley Conservancy and the oaks were in their full glory. I continue to be puzzled by the oak colors, because there are so many different colors and hues. Some of the variation in color is probably related to species, but when you see two oaks of the same species side by side, you sometimes wonder. We have three major species of oak, and a minor one. The two most important (because they are long-lived and have the characteristic open-grown form of the savannas) are bur and white oak. Although bur oak is probably the most characteristic of a savanna, it is a complete disappointment as far as fall color is concerned. The leaves turn a mottled yellow and brown and then fall to the ground. No photo of a bur oak in this blog. 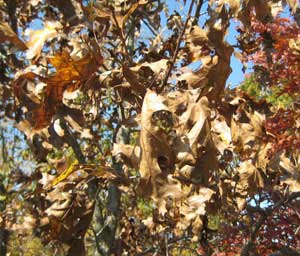 The red-colored leaves in the photo to the left are from a small white oak. You can tell that the oak in this photo is a white because it has rounded lobes. 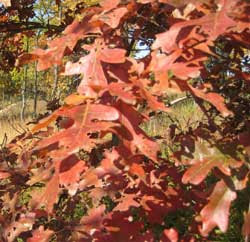 Two other oaks we have are black and red. 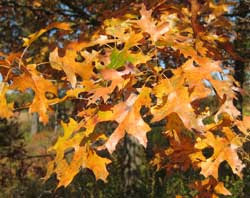 Although some of the black oaks are nicely colored, many are just a dirty brown, such as the one in the photo below. Finally, the oak with the orange leaves is a "red" oak. You can tell it is not a white because its lobes are pointed rather than rounded. Confusing that the white oak leaves are red and the red oak leaves are orange, but that seems to be the way it is. However, the oak in the top photo is a red oak that looks its part. This small tree, at the edge of Toby's Prairie, contrasts strikingly with the "green" oaks in the background (which are actually "whites"!). To make things more confusing, black and red oaks sometimes hybridize. In fact, some of our confusingly colored oaks might actually be hybrids. 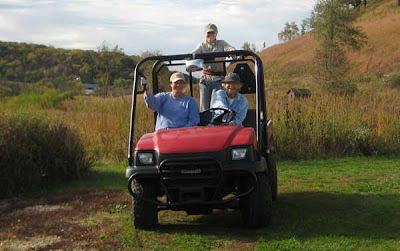 Kathie and I are fortunate to have three expert seed collectors working at Pleasant Valley Conservancy right now. How do you become a professional seed collector? 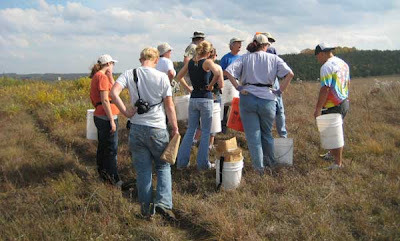 There are no university courses in seed collecting (although the Tallgrass Prairie Center at the University of Northern Iowa has a fine one-day workshop). You learn to collect seeds by working along side some experts, and Marci, Heisley, and Susan have had years of opportunity of working with Mark Martin, the king of seed collectors. Right now seed collecting is at its peak. So many species are "ready". 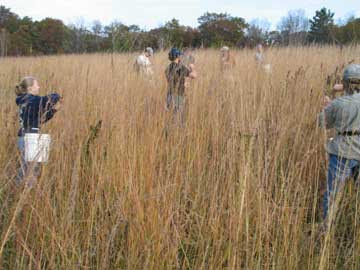 Many people can learn to collect one species at a time. Our three professionals can collect lots more than one at a time. They carry two buckets, lots of bags small and large, and well-sharpened clippers. But what is really needed is a sharp eye and the knowledge of what each species looks like when it is ready. You don't learn this in books. You learn by doing. And, believe it or not, it is fun. Note the smiles on their faces. Every October we have a seed collecting work day around the second Sunday in October. Seed collecting takes place not only at Pleasant Valley Conservancy but at nearby Black Earth Rettenmund Prairie. These are both State Natural Areas. We start at Pleasant Valley at 10 AM, break for lunch at noon (provided by us; see photo above), and then move on to Black Earth Rettenmund for the afternoon. Participants can work at either site or at both (lunch either way!). This year the date is Oct. 12, 2008. We have lots of seeds to collect and the prairies are in great shape. We would be delighted to have you! For more details, call Tom or Kathie Brock at 608-238-5050. Our savanna oaks don't show much classic fall color, so it is a joy to run across a splash of red among the woods. 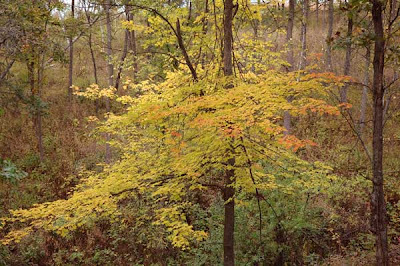 The photo shows a small red maple that is living among some hickories, basswood, and a few oaks in an isolated valley on our property. The particular aspect here is due north, and since it is down in a ravine, the condition is fairly shady. Perfect environment for a shade-tolerant tree. When I showed this maple to Kathie she said: "We should protect it from fire." I reminded her that we had actually burned this particular area last spring, and the fire had carried surprisingly well. However, no fire down in this ravine is going to burn especially hot. We used to have a group of red maples on the north side of Toby's Prairie, but that prairie burns very hot and the maples were heat-girdled and were dead by mid summer. 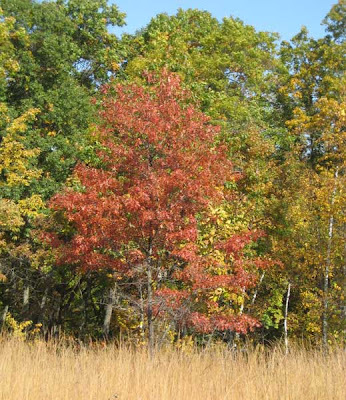 Of course, maples don't "belong" in an oak savanna/prairie environment. But they really do add some nice color. Yellow giant hyssop (Agastache nepetoides) is a State Threatened species that is found in open woods and savannas. We have had it growing fairly well for about 10 years and have contributed seed to some other savanna restorations in southern Wisconsin. It is found in only a few counties in the southern part of the state, and even in these counties it is not very common. Our seeds came from a Dane County source. When we first planted, this species grew very well, but then seemed to fade out. This year it is back again, and there are enough plants so that we can collect seed. This plant is in the snapdragon family, and the small flowers are not especially showy. When seed formation occurs, the seed receptacle opens but the tiny seeds remain inside in a cup-shaped structure and slowly sift out. This gives a clue to how to collect the seeds. You cut the seed heads off carefully, holding them vertically, and then carefully turn them upside down into your collecting bucket. 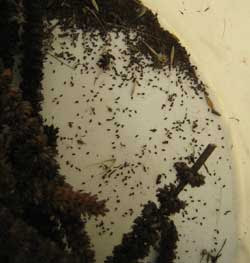 A lot of the seeds spill out then and can be seen in the bottom of the bucket (see photo below). Not all the seeds are released in this way, and the rest must be removed by handwork or with a hammer mill. Once all the seeds are out, the crude seed material is purified by screening through a fine mesh. There is also another hyssop that thrives in savannas, purple hyssop (Agastache scrophulariaefolia). We were given a small amount of seed from a nearby site and introduced this also about 10 years ago. For many years we had just a few plants, but in recent years it has spread well through the savannas. In fact, we had one site this year in Unit 13 that had both species flourishing side by side. Once they set seeds, these two species look very much alike, and one has to pay special attention to the leaves, stem, and shape of the seed head to determine which is which. 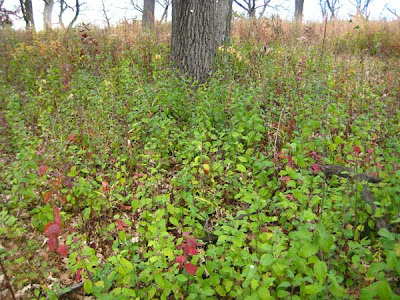 Getting rid of large buckthorns is the easy part (really!). But the ferocious seed bank means that small buckthorns will keep coming for (who knows how many) years. These small ones can be handled by the laborious work of cutting with a handclipper and treating every cut stem with herbicide (triclopyr, Garlon). But even a small patch handled that way will take hours, and lots of stoop labor. Also, the small ones are fairly hard to find mixed in with all the other herbage. But right now, and for perhaps a week at most, these small buckthorn shoots can be easily seen, making foliar spraying possible. 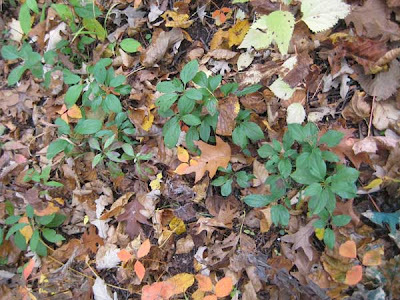 Most of the native vegetation is dying back and the leaves are turning yellow or brown, but the buckthorn leaves remain green and can be easily seen. I assume the leaves remain green because this exotic invader remains adapted to the European or Asian environment where it came from, which has a longer growing season. 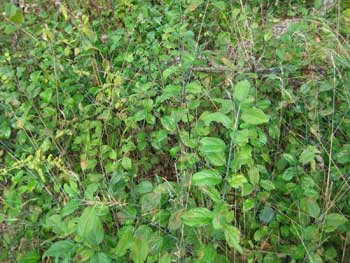 We did some foliar spraying last fall, but got started a little late and the buckthorns were already losing some leaves. This year I determined to get them earlier, and have been monitoring several egregious infestations. 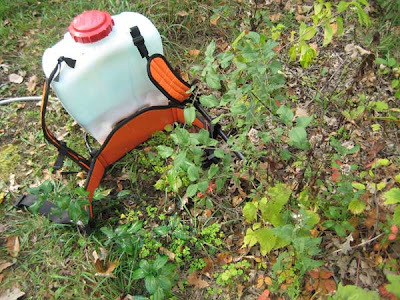 Today I sprayed a couple of major patches in the bur oak savanna. What would have taken hours I was able to handle in minutes. As the photos show, these buckthorn stems are fairly short, and quite leafy, making it possible to spray them without spraying good plants. Even if a few good plants are hit, triclopyr only affects broadleaved plants, so that grasses, such as the savanna ryes and brome, will not be affected. The top photo shows one of our Solo backpack sprayers with the special custom straps that make it possible to work all day long without getting too tired. This harness is a little expensive (from Forestry Suppliers) but is worth it. For several years I have been monitoring carefully the locations of our buckthorn infestations, and concluded that they are primarily in areas with an underlying dolomitic rock base. At Pleasant Valley Conservancy dolomite is mostly restricted to the top of the ridge. Off the ridge top, the bedrock is sandstone, and buckthorn is almost absent (honeysuckle instead). A review of the European ecology literature uncovered a very detailed paper on the distribution of buckthorn in England. It turns out that it is restricted to carbonate rock areas there also. In fact, the English consider buckthorn to be a "calciphile". Since our dolomitic areas are fairly small, I am encouraged that we will eventually be able to bring buckthorn under control. Unfortunately, it took us too many years to realize how bad the seed bank was, and as the photos show, we have some fairly significant infestations. This is the time of year when the prairie grasses take on their rich brown color. Our south-facing slope, which is mostly little bluestem but with scattered Indian grass and big bluestem, looks great right now, especially with the fine open-grown bur oaks in the background. I have been wanting to photograph this hillside for the past two weeks, and yesterday I finally found the time to climb the slope and take some pictures. As those who have read the history of Pleasant Valley Conservancy know, in 1998 this hillside was mostly invasive shrubs and trees. The scene now is ten years after it was cleared and burned annually. Soon after we cleared the slope, there was only scattered prairie grasses. As the years progressed, the grasses have marched up the hill, especially in the more open areas. This upper slope originally had lots of honeysuckles, and we have been dealing with them for most of this past ten years. Once we got rid of the big ones, we had to contend with the seed bank. We cut and herbicide-treated all the honeysuckles on this slope three times since 1998. Then last year we "finished them off" with a glyphosate foliar spray in late October, after all of the "good" vegetation had senesced and was no longer sensitive to the herbicide. Part of my reason for climbing the slope yesterday was to assure myself that last year's work was satisfactory. The answer was yes. I did not see a single honeysuckle on the whole slope. It is encouraging to realize that with persistence one can eventually win out in this battle against invasive species! A visitor from Colorado especially admired our south-facing slope, which he said reminded him of the short-grass prairies of eastern Colorado. 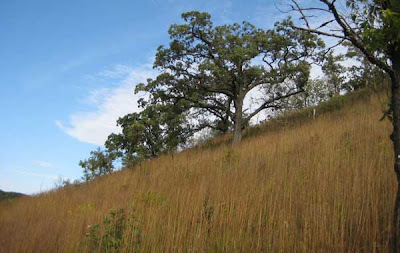 Although we generally think of Wisconsin as part of the "tallgrass" prairie/savanna complex, under the harsh conditions on this sun-exposed slope we really do have a short-grass prairie. American bittersweet (Celastrus scandens) is now in its colorful phase, with big bunches of red fruit hanging from the ends of the stems. Bittersweet was here even before we started restoration, and on the south slope we used to see it climbing buckthorn and other woody shrubs. All those shrubs are long gone, but bittersweet is still around. It no longer has anything to climb on, but seems to be just as happy spreading out along the ground. For some reason, it seems to be especially prolific near Pleasant Valley Road, so it is easy to see during a leisurely stroll down the road. Asian bittersweet is also prevalent in Wisconsin but fortunately we have only the native one. Gardeners like this colorful plant, and often provide vertical poles for it to climb on. The berries in the photo are immature. Later they will split open to reveal a crimson seed.